Confusion reigned in the first inning yesterday, May 9, 2018, at Great American Ball Park, where the Mets batted out of order in their game against the Reds. Before we look at what happened, a fundamental point of the rule is, when a batter bats out of order and it’s appealed, the batter who failed to bat in order is called out. Keep that in mind as wind your way through the following scenario. Nimmo, batting in his proper leadoff spot, struck out. Then Flores, (improper batter) who was scheduled to bat third, struck out. According to the lineup card handed to Morales, Cabrera should have batted in the second slot. When Cabrera batted in the No. 3 spot, he came to the plate out of order. If Calloway caught the violation he could have had Flores bat again in his proper No. 3 spot. If Reds’ interim manager Riggleman appealed at that point, the only thing the umpire would do is bring Flores to the plate and have him bat again with two outs. But Riggleman wisely waited. He knew that he had a chip to play with if an improper batter did something constructive as some point in the game. He was probably surprised that it came so soon. After Cabrera, batting out of turn, doubled with two outs, Riggleman alerted the umpires to the batting out of order violation. Bruce was then called out for failure to bat in turn. Why was Bruce was called out who never batted? According to rule 6.03 (b) (7), if an improper batter (Flores) completes his at bat, he becomes the proper batter if there is a subsequent pitch or play. As soon as a pitch was thrown to Cabrera, it legalized Flores’ improper at bat. Therefore, the No. 4 batter in the lineup, Bruce, should have been the batter when Cabrera doubled. So, Bruce was called out for failing to bat in turn after Riggleman brought the problem to the attention of Morales. By having patience, Riggleman was able to get the third out and burn the No. 4 spot in the batting order. Gonzalez properly led off the next inning. Mets manager Mickey Callaway called it “an administrative thing that I didn’t take care of,” blaming himself for declining to “double-check, triple-check and quadruple-check” the card that third-base coach Gary DiSarcina is typically responsible for writing. For the most part, the broadcasters handled it well although they could not explain why Bruce was called out. Because of the confusing nature of the rule, let’s give the men behind the mic a pass here. 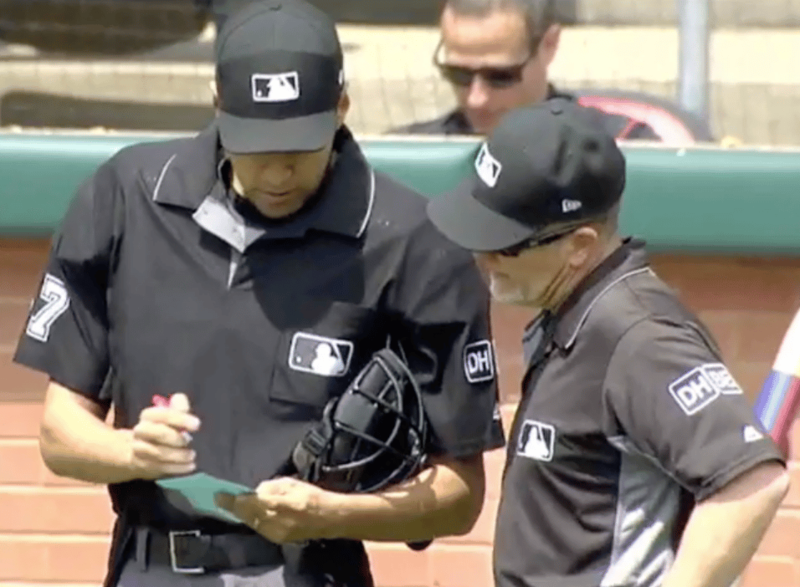 double-check the order posted in the dugout with the one given to the plate umpire. I would recommend having a back-up (coach) to check the lineup card. (2) When a batting out of order is appealed, the batter who failed to bat in turn is the one who is called out. The umpire must remain mute unless appealed. Let’s see what happened when the Brewers batted out of turn in their 1-0 victory over the Nationals on July 4. 2016. The official Brewers lineup card handed to the umpires and Nats’ manager Dusty Baker had Jonathan Lucroy batting third, Ryan Braun in the No. 4 slot and Aaron Hill batting fifth. In the bottom of the first inning, Braun incorrectly batting in Lucroy’s number 3 spot, collected a two-out single off Nationals’ pitcher Max Scherzer. Baker then emerged from the dugout to appeal the batting out of order snafu. The umpires properly called Lucroy out, for failing to bat in turn for the third out. Braun batted in his proper No. 4 spot to lead off the second inning and grounded out. count. On the other hand, if Calloway recognized the batting out of order faux pas in the middle of Flores’ at bat, he could have sent Cabrera, the proper batter to the plate to inherit Flores’ count. Also, Calloway could have corrected the batting out of order at any time during the game. It’s not true that the offensive team must follow the same order throughout the game if a batting out of turn situation arises early in the game. (3) When batting out of order occurs, the appeal must be made before the next pitch or play. Riggleman appealed before the next pitch and Bruce was called out because he should have batted after Flores, the No. 3 batter, was legalized when a pitch was thrown to Cabrera. (4) Believe it or not, almost 10 years to the day, it was the Reds who batted out of order in a game against the Mets at Shea Stadium. Generally speaking, when the manager of the defensive team catches the offensive team batting out of order, it’s a good idea to keep the appeal option for a point later in the game if the improper batter is put out and he continues to bat out of order. But there’s an exception to the rule. Take what happened in the Mets-Reds game at Shea Stadium on May 11, 2008.
the inning but Ross, (batting out of turn), did instead and flied to right field. At that point, Mets’ manager Willie Randolph approached plate umpire Dale Scott to inform him that the Reds had batted out of turn. After about 12-minutes of trying to dissect the situation, Scott and his crew correctly ruled Patterson out for failure to bat in turn. And Scott ordered Ross to bat again in his proper No.9 spot. Randolph was criticized in some circles for appealing when he did since the improper batter (Ross) made an out. I think the criticism might have been unwarranted. If it was earlier in the game, I would agree since it would have given Randolph an ace (out) in the hole, if needed later in the contest. But in the ninth inning with an 8-3 lead, there really was no need to hold his appeal option. And by appealing when he did, he forced Ross (.222) to bat a second time with one out. Ross, with a new life, proceeded to collect a single.